Granite is widely known as one of the best countertop materials because of its durable nature and timeless appearance. It has maintained strong popularity throughout decades of rapidly changing interior design trends. But with so many colors to choose from, picking the right color granite countertop can be tough. Light colored granite countertops are versatile and can be the perfect finishing piece for many kitchen designs, from classic to contemporary. 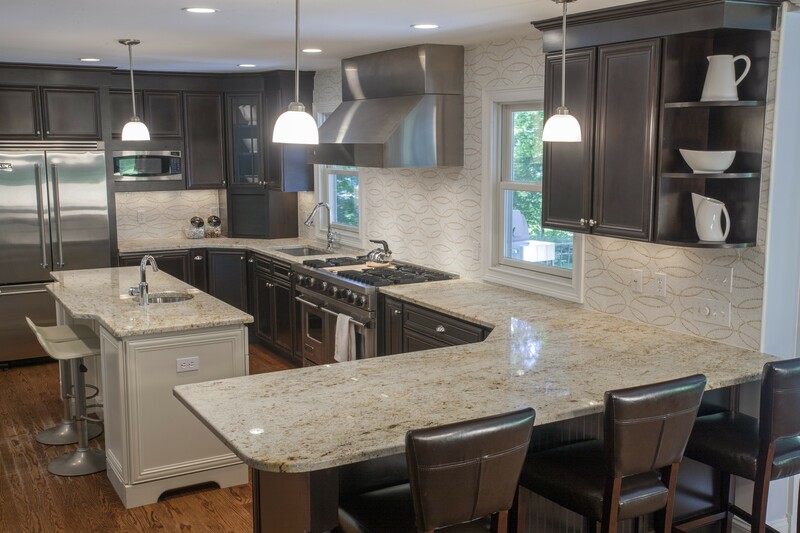 Let's take look at some of our favorite light granites for kitchen countertops. First, we would like to provide you with a small reminder. All natural stones are completely unique, and no two slabs will ever look exactly the same. Because of this, it is important to visit one of our locations to see the variations in person. We have over 2,000 different colors in stock and provide you with samples so that you can see what the color will look like in your home. Bianco Antico is one of the most popular granites at Marble.com because of its fashionable elegance. Grey accents and hints of burgundy make it easy to use as a kitchen countertops and even as a full backsplash as we see here. This funky kitchen is a cook’s dream. 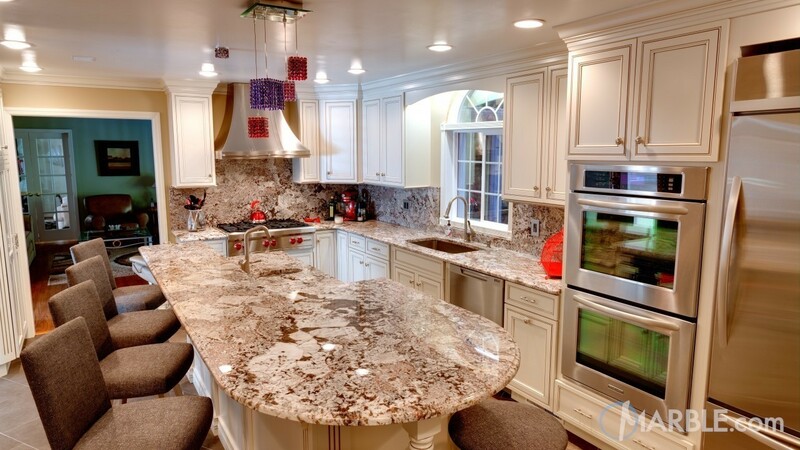 The Bianco Antico granite with an ogee edge contains light shades of color and sets off the white cabinets perfectly. The wooden floor bridges the kitchen and living room together to make everything flow. Adding some simple accent colors really bring the kitchen to life. Astoria is a consistent beige granite with slight movement and black speckling. It is subtle in appearance but it can be the perfect natural stone for moderate kitchens or a large one, like we see here. A light countertop allows for the space to feel open and unrestricted. 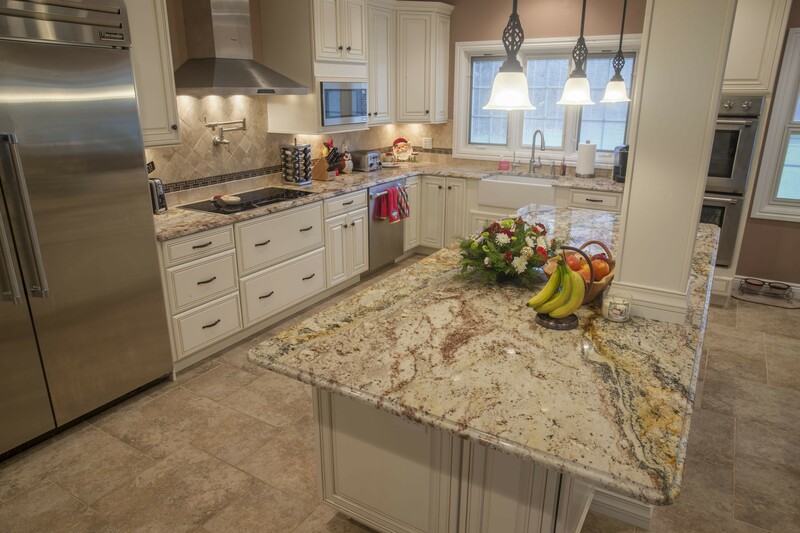 The natural browns and creams in the Astoria granite are a beautiful compliment the light brown cabinets. 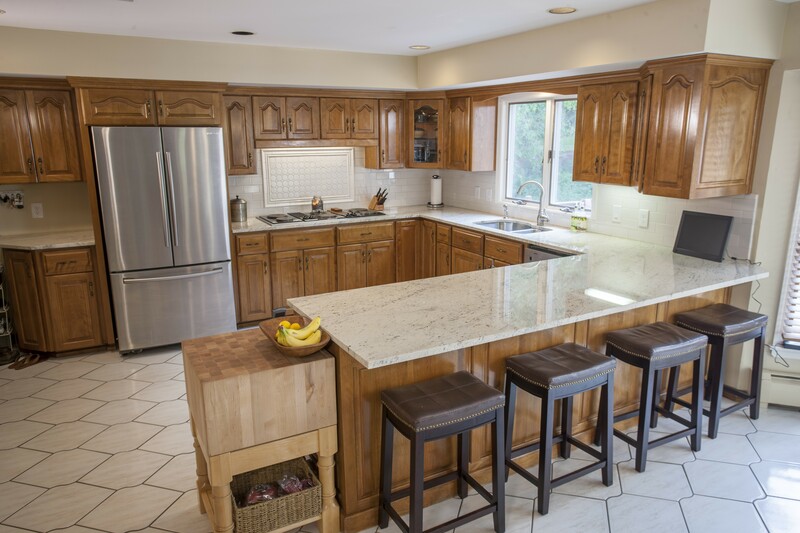 Using durable granite countertops for the working areas and serving areas makes for an easy cleanup. Light countertops save this space from potentially appearing too dark because of the absence of windows in the kitchen area. Typhoon Bordeaux is a truly beautiful Brazilian stone that’s sure to make an artistic statement as a kitchen countertop. Its intricate color design typically features burgundy, gold, and grey. In this kitchen, a large island featuring Typhoon Bordeaux is the focal point of the room. Thanks to the broad range of colors represented in this countertop, it pairs well with both light and dark cabinets. A classic, ogee edge on the center island and perimeter countertops provide a luxurious style, which is the finishing touch for this gorgeous kitchen. Colonial Gold is a popular light granite with slight movement. Small maroon speckles scattered throughout the stone offset the subtle color combination of white, grey, and beige, making it a great options for kitchens of any style. Here, Colonial Gold pairs wonderfully with a variety of golds, creams, and browns in an open kitchen design. The extensive countertop space not only provides ample room to prepare and serve meals but because of its light shade, it also enhances the size of the room. Viscont White is a pristine granite option that is white with grey veins. The neutral palette of these countertops is practical and ideal for a variety of decors, especially contemporary designs like seen in this kitchen. Despite its quaint size, light design elements, like Viscont White countertops, ensure the room does not feel cramped. Because of its complexion, a large variety of accent colors and design features can be used without creating a harsh contrast of colors. The brushed finish on these counters adds a textural element that causes them to appear slightly lighter. 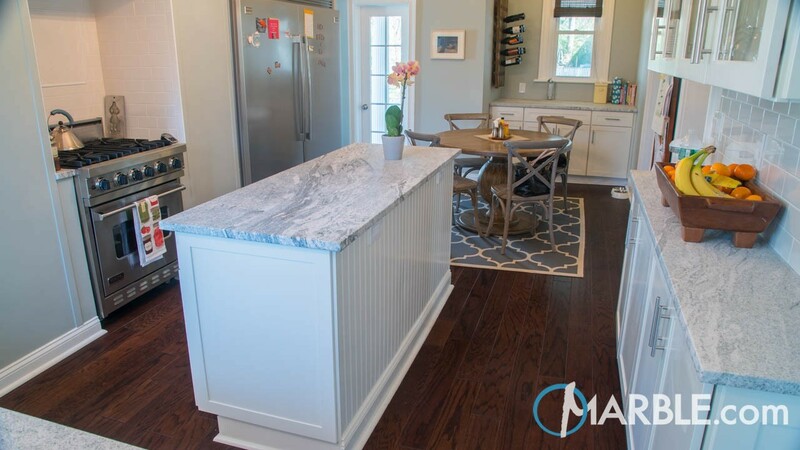 When choosing the perfect countertop for your kitchen, bathroom, or any other project, be sure to consider additional design elements in the room. Features like appliances, cabinets, and backsplashes will help determine the right stone for your space.